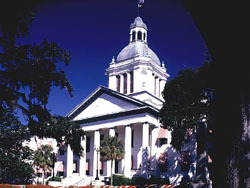 The current Capitol is the fourth building to serve as Florida's Capitol. 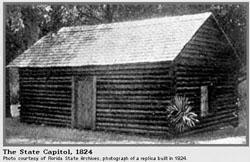 The first Capitol was a log cabin built in 1824 with the establishment of Tallahassee as the territorial capital. In the early 1820s, legislators transferred government business from St. Augustine to Pensacola for alternating sessions. Travel was hazardous and took almost 20 days. As a result, Tallahassee was chosen as the capital of American Florida in 1824, primarily because it was the midway point between the two principal cities. In 1826, a two-story masonry building measuring 40 feet by 26 feet was built. It was to be the wing of a larger structure planned for the future, but financial problems prohibited its completion. As Florida moved toward statehood, the needs of government grew. There arose a demand for a suitable state house or public building for the Territorial Legislature. On March 3, 1839, Congress appropriated $20,000. The old structure was torn down immediately, and Florida's government temporarily moved into rented quarters. Builders commenced work on the third Capitol, a brick structure, in 1839 and completed it by 1845. This structure still remains the core of the Old Capitol. 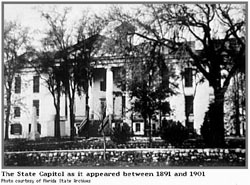 The Capitol remained virtually unchanged during Civil War years, when Tallahassee was the only Confederate capital east of the Mississippi that avoided capture by federal troops. By the 1880s, Florida suffered growing pains caused by an economic boom and an expanding population. By 1891, the Capitol needed thorough repairs. The building was repainted; a small cupola was added; and plumbing was installed. 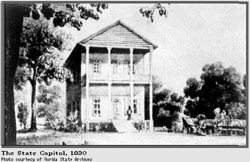 There has twice been debate regarding relocating the Capitol. However, in 1900, relocation was placed on the ballot and was voted down. In 1902, the addition of two wings provided more room for the growing state government, and the familiar dome was added. This was the last time Florida's government operated under one roof. By 1911, state government began moving to other buildings. Further additions to the Capitol were made in 1923, 1936 and 1947. In 1969, the Governor and the Cabinet approved plans for the New Capitol when it was determined the Old Capitol could no longer accommodate state government and the legislative body. Debate on relocation resurfaced in the early 1970s but never made it to the ballot. In 1972, the Legislature authorized money for a new Capitol Complex to include House and Senate chambers and offices, along with a 22-story executive office building, which was completed in 1977. The architects and engineers for the New Capitol were Edward Durell Stone of New York and the firm of Reynolds, Smith and Hills of Jacksonville. Instead of the traditional brick and columns, the Capitol Complex was done in International style to reflect a modern Florida. 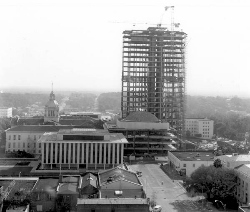 The first phase of the new Capitol Complex started in June 1970 with site preparation for the five-story office buildings for the House and Senate. These buildings were designed to provide legislative committee rooms and member offices. Excavated in November 1973, the three lower-level floors of the Capitol are below street level. The steel structure was completed by 1975. It took three years and 10 months for the 718,080-square-foot Capitol to be declared complete in August 1977. 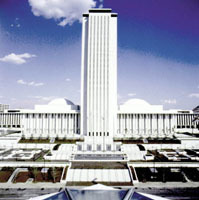 With the west plaza unfinished, the building was officially opened for the 1978 Legislative Session. To ensure that there would not be a "mortgage" on this new building, the $43,070,741 price tag was paid before the first cornerstone was laid. An additional $1,957,338 was committed to landscaping the west front area. This area is known as Waller Park. It was named after Judge Curtis L. Waller of the United States Circuit Court of Appeals. The complex consists of three structures: a 22-story high-rise tower with two legislative office buildings. These buildings, the House Office Building on the north side and the Senate Office Building on the south, are connected by skywalks to the New Capitol. A third skywalk connects the Capitol to the Knott Building. The tower design of the New Capitol is similar to the design of the state capitols in Louisiana, Nebraska and North Dakota. Edward Durell Stone (1902–1978) was an award-winning architect and an early proponent of modern architecture in the U.S. Early in his career, he designed the main lobby and grand ballroom of the Waldorf-Astoria Hotel, assisted on the Rockefeller Center project and served as the principal designer on Radio City Music Hall. He was the design architect, in collaboration with Philip Goodwin, for the Museum of Modern Art. During World War II, he was the chief of the Planning and Design Section for the U.S. Army Air Forces. After the war, he reopened his firm. He also served as the chief design critic and associate professor of architecture at Yale University. In 1955, the New York Chapter of the American Institute of Architects awarded Stone the Medal of Honor. Some of the buildings Stone designed in the next two decades included the following: the Stanford University Medical Center (Palo Alto), the Gallery of Modern Art (New York City), the National Geographic Society headquarters (Washington D.C.), the John F. Kennedy Center for the Performing Arts (Washington D.C.), the Standard Oil Building (Chicago), the Pakistan Institute of Nuclear Science and Technology (Islamabad) and the Florida State Capitol (Tallahassee). The Historic Capitol is located in front of the New Capitol building. Its restoration became an issue in 1978. Then Governor Reubin O'D. Askew and House Speaker Donald Tucker favored outright demolition; however, the Old Capitol building was saved. Upon completion of the new Capitol Complex, the Old Capitol was restored and refurbished to its 1902 version and was reopened to the public in 1982. Herschel Shepard, a restoration architect, was quoted as saying, "the Old Capitol will be like a jewel worn by the New." The Old Capitol now serves as the Florida Historic Capitol Museum. Its restored space includes the Governor's Suite, Supreme Court, House of Representatives and Senate chambers, rotunda and halls. Its adapted space contains a museum exhibiting the state's political history. 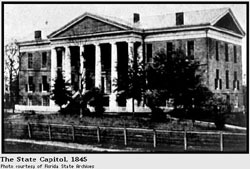 The 1902 Capitol building was the last statehouse in which all of Florida's political business was housed under one roof. For more information, please visit the Historic Capitol Museum's website: http://www.flhistoriccapitol.gov.